MONTREAL – Montreal Canadiens general manager Pierre Gauthier announced Tuesday the signing of goaltender Cedrick Desjardins to a one-year, two-way contract for the 2010-11 season. As per club policy, financial terms of the agreement were not disclosed. Desjardins, 24, led all AHL goaltenders in 2009-10 with a 2.00 goals-against average in 47 games. He posted a 29-9-4 record, finishing fourth in the league in wins, and second in shutouts (6). His 29 wins set a franchise record for the most in a season for a Bulldogs goaltender. He also ranked sixth in the AHL with a .919 save percentage. Desjardins helped the Bulldogs reach the AHL Western Conference Finals, while posting a 6-4-0 record in 10 playoff games. He played in the AHL All-Star Classic in 2010 and was named to the AHL Second All-Star Team. He also set a franchise record with the longest shutout streak by a Bulldogs goaltender (212:37 mins). 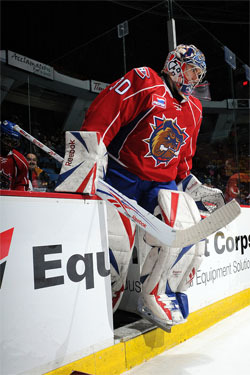 The 6-foot, 194-pound goaltender played 92 career regular season games in the AHL with the Bulldogs. He posted a 41-26-6 record along with 10 shutouts. Desjardins won the Kelly Cup with the ECHL Cincinnati Cyclones in 2007-08 (Playoff MVP), and the Memorial Cup with the Quebec Remparts in 2006. A native of Edmunston, NB, Desjardins joined the Canadiens as a free agent on July 3, 2008.